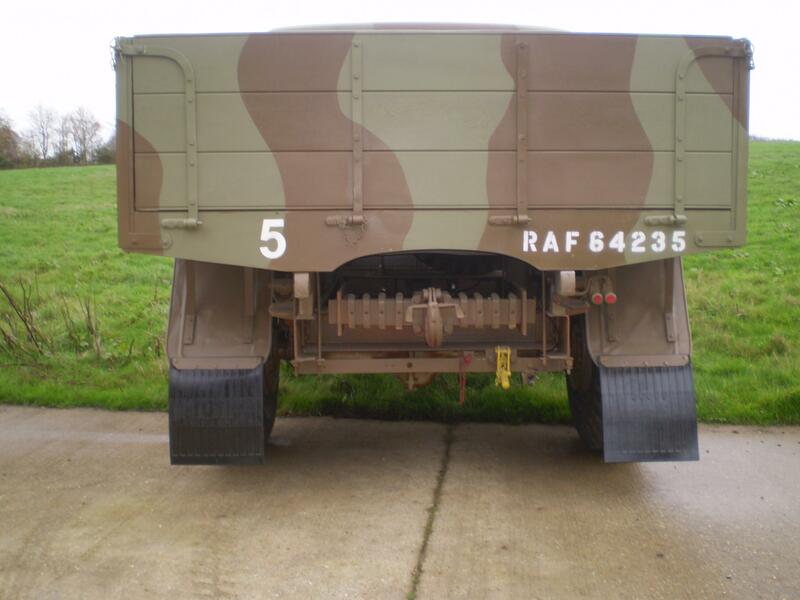 Hi guys I want to mark up my Humber box Heavy utility as an RAF vehicle based at RAF Enstone in WW2. I know that it would have B/91 on one wing & RAF on the other ? but I would like to know the correct size of the roundel, the correct size & font of the RAF12345 on the door & any other markings front, rear or side ? I believe there is a book out there showing this info ? Ian, This is extracted from the regs. 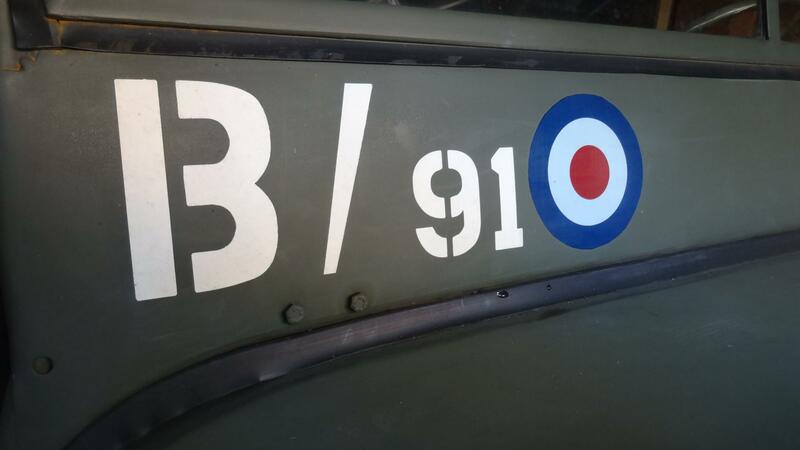 offside wing roundel with the B/91 above it. the roundel should be: outer dia 9 inch, middle 5.4inch, inner 1.8 inch- sorry they are in tenths but that was the ruler I used. The Command/Group code should be 5 inches high ( in white) in a plain style. Roman numerals are not to be used. NO roundel on the back, but the Command /group will be displayed on the back- should be applied between the centre line and left side as viewed. I have never found the size for RAF 1234 etc but it should be white displayed front and rear . But I would guess the same size as those used on civillian number plates ?? 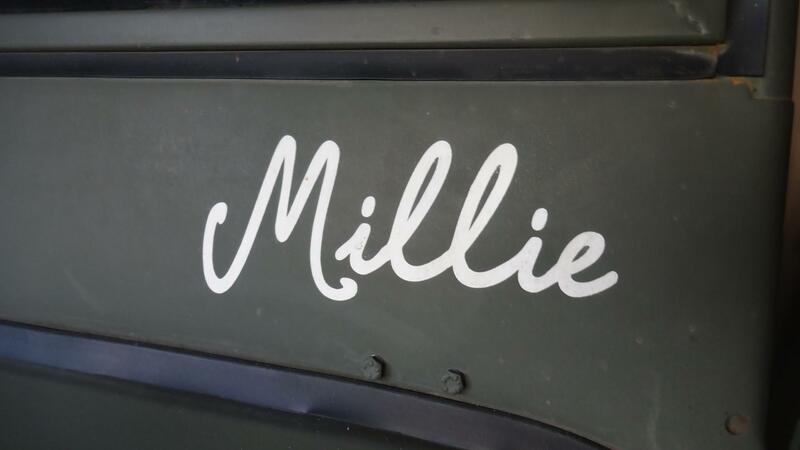 The application of the aluminium letters RAF on the doors or vehicle sides was ceased when the roundel was introduced. 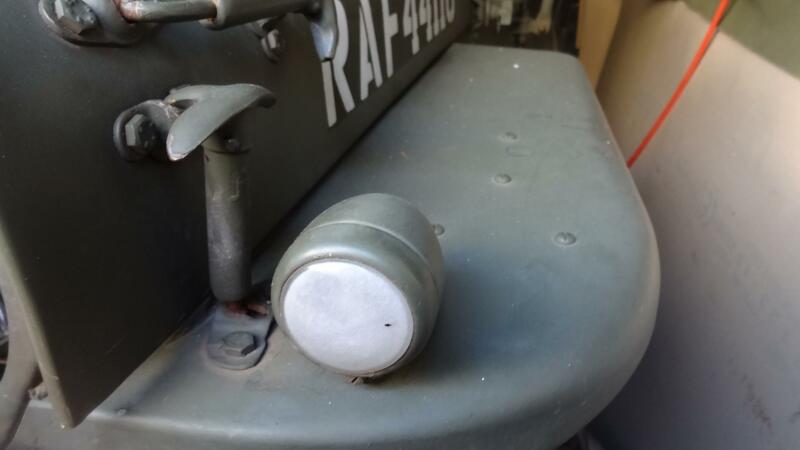 Correct Larry my Humber is staying green as is my Jeep, they were NOT blue :angry The jeep is not strictly correct as the bonnet number is 'made up' & the RAF roundel is a modern adhesive type but its looks ok. 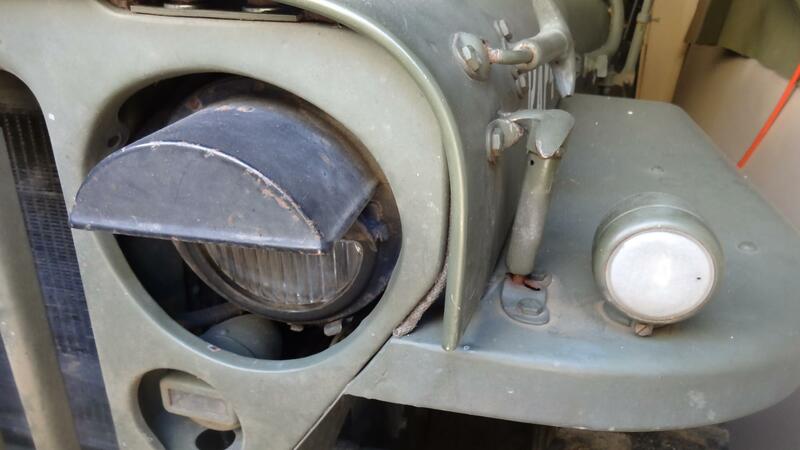 Note the correct Buttler side light & headlamp & no US blackout light. What colour/s where they? 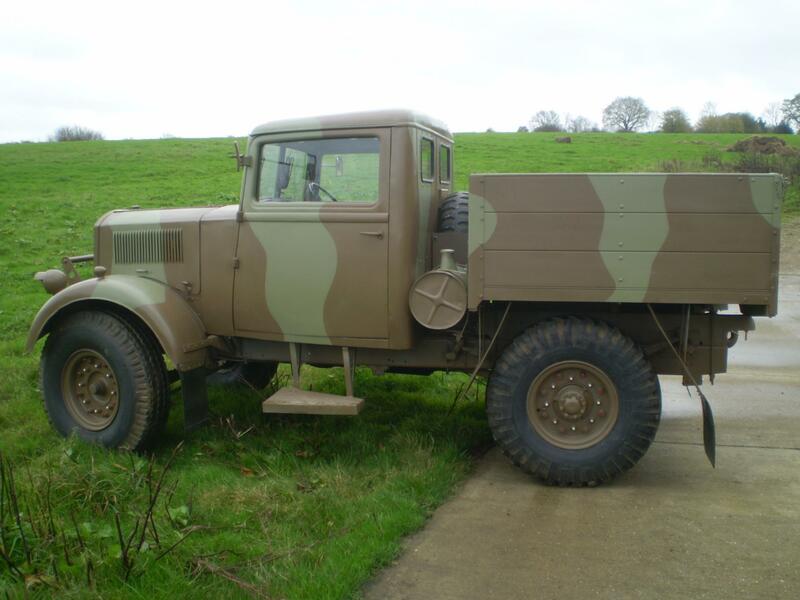 as per Army vehicles following their respective colour changes as the war progressed? When did the blue colour come in? Hi Ted thanks for that info, you mention that the RAF12345 is front & rear ? but most people put then on the L/H door, is that incorrect ? When did the blur colour come in? Do you mean when did the blue go out ? I thought it was early 1940-41 ish ? 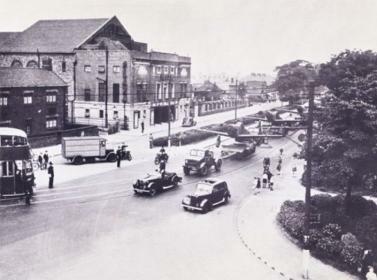 Was blue used pre war and post war? The reg number or to give it its correct RAF title Identification Number did seem to move to the left door and by late war many vehicles seem to be displaying on both doors; that said looking through my picture files vehicles embarking for Normandy some QLs had it on the sump guard- some above the windscreen some on the -- I could go on , but the majority I would say are on the front; Colour yes from 1941 AMOs mirrored the Army. pre WW2 RAF Blue grey, but photographic evidence shows most vehicles in France 1939/40 were cam as were those on aerodromes at home; The sticking block is the first AMO which gives anything is 1941, I think this date misleads due : A the photo evidence and B the cam requirement would have been in the mobilisation instructions. So we know they went cam but what colours ? I go with what the army were doing at any particular time; I have seen some home movie film in colour taken at RAF Aldergrove just before war was formally declared - everything in sight was being cam sprayed including the pilots personal cars !! I have seen some other similar film taken during the BoB and the vehicles are in a similar scheme to the aircraft parked near them which suggests KG3 and dark green. 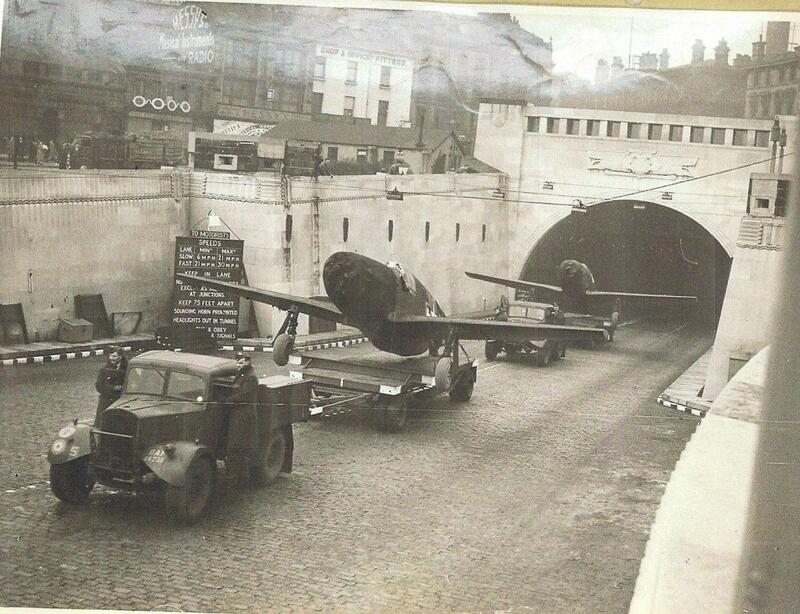 and of course the RAF B/G came back in 1946 in time for the London victory parade. One thing Ted missed was that the 1941 AMO implies that camouflage paint schemes were officially in widespread use but not necessarily "uniform" across the service. P.S. It's always nice to see when someone has put an RAF vehicle in the right colours Ian. 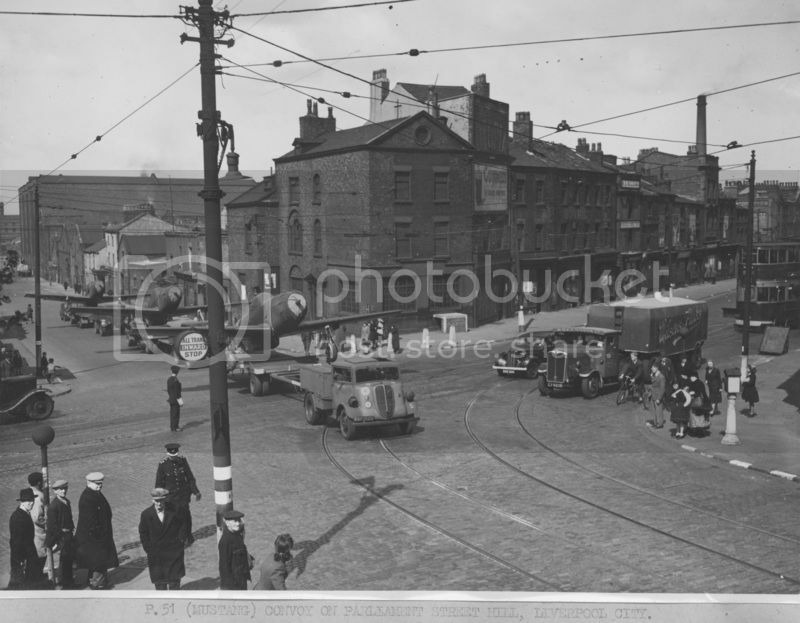 I think the markings on my WOT 3 are correct as coped from a 1942 picture . My guess is that the Jeeps arrived from 41 onwards in US olive drab & properly stayed in that green and had an RAF number stencilled on ? why bother painting a different shade of green ? Once into a cam colour repaints were only carried out on a necessity basis. Certain organisations did not use the B/91 type of marking. Across the UK the RAF had regional MT Companies , They were to bear their company number as in Tony's pictures, No 5 were based in Liverpool and one of their main tasks was moving aircraft that arrived by sea from the US of A to Speke where they were assembled. One of my favourite items in the RAF Museum collection is a photograph album of various movements by 5 MT Company, which contains a copy of the above photo. There is an eclectic collection of vehicles being used. Indeed I remember finding a picture of their Mack 18 ton former tank transporter. Over the years the MT companies must have carried some weird and wonderful stuff. 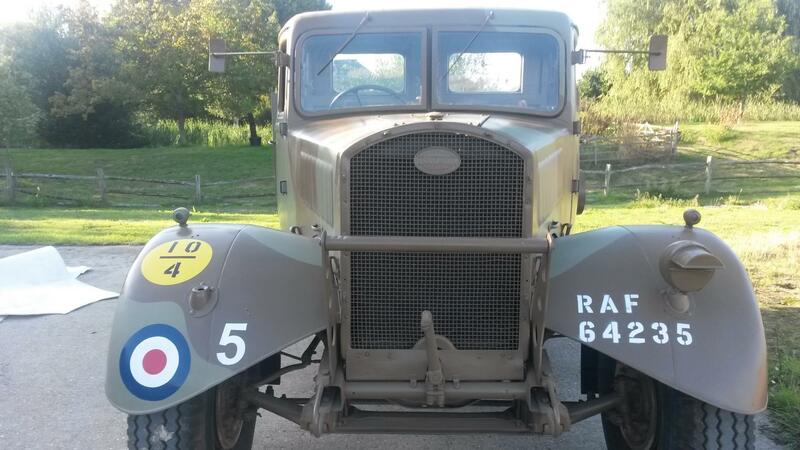 Tony, well done for your restoration and what a stroke of luck to find a photo of it in service. Its interesting to see RAF personnel as outriders on the Fordsons, like gangsters or secret servicemen on the President's car! NB Are you still looking for a trailer and a P-51 to put on the back? The one above, which is from the album I mentioned, is the desktop on my work PC! The previous picture is, I believe, of normal OX tractors, since these were built to do the job so no need to convert them into tractors if that makes sense? 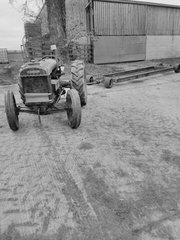 How about a Fordson 7V based Tructor, from the same source as above. Ian, This is extracted from the regs. offside wing roundel with the B/91 above it. The Command/Group code should be 5 inches high ( in white) in a plain style. I have never found the size for RAF 1234 etc but it should be white displayed front and rear . What does the B/91 signify? Where it is based or the Command it comes under? Is the Command/group the number RAF1234 etc? Presumably this is the vehicles registration/census number as per the Z number on Army trucks? The B/91 is not a particular base but B= Bomber Command 91 = 91 group - group within Bomber Command, 91 Groups role was Operational training of Bomber crews. 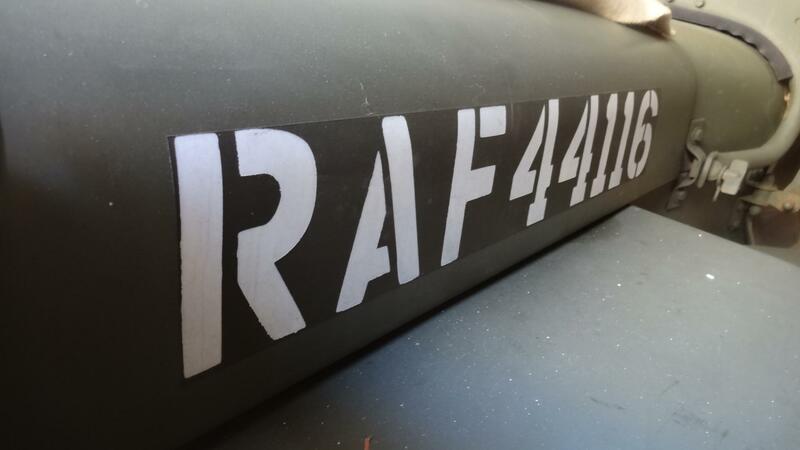 The RAF Identification number is RAF 1234 etc often refered to as reg or census number. Its an OXC , I've seen a couple of shots where 5 MT are using OXCs, I have a shot somewhere of the IXC being used on a USAAF base and the tail wheel of the oplane is mounted somewhere on the 5th wheel coupling ?? 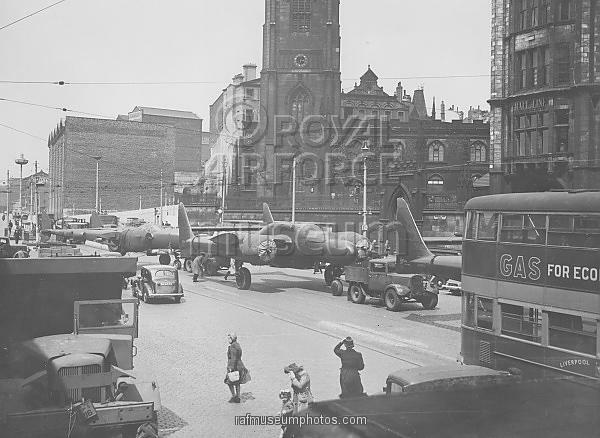 and in late 1944 it all went into reverse with aircraft being embarked at Liverpool for wars further afield ; What with all the toing and froing to and from Pearsons Liverpools streets must have been exceptionally busy in the war years .